Concrete crusher and concrete milling machine are the right construction equipments to process and recycle let-off building concrete. Because of its availability in any hard working environment, mobile concrete crusher is the most widely used concrete crusher in construction waste processing. As the leader portable concrete crusher supplier in China, SBM’s mobile concrete crushing technology offers the complete range of mobile concrete crushers to meet every application requirement. 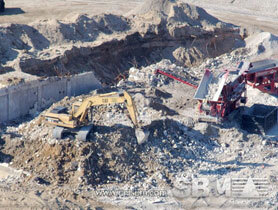 SBM portable concrete crushers mainly have two types: tyre-type and crawler type portable concrete crusher. Each type of portable concrete crushers is equipped with any one of our four series different SBM concrete crushers to meet different capacity and final products granularity. SBM is a Recycler of Concrete, Brick and Asphalt, and is major supplier of recycled concrete and brick products with plants. SBM will supply you both concrete crushers with best quality and service like installation and technical documentation guiding commissioning. Mobile concrete Recycling Plants can be moved to various locations economically. Track-mounted plants allow superior on-site mobility. Portable Recycling Plants Choose the right crusher for a particular concrete recycling project. "We were already using SBM PE jaw crushers as concrete crushing machine, so we researched screens and came up with a package deal. It was a natural fit."